I know there are variables on this question, so I will stick with .224 for now. In a nut shell how I am stepping off into this. Went to the last day of an estate sale, everything was 1/2 off or more. There were lots of die sets there. None in boxes all were in zipper bags. I picked up what I was interested in or had use for. Lady came by and said take them all and she would make me a heck of a deal. I won't say what I gave per set, as y'all would give me a pet name,lol. There was a complete set of Corbin 7/8x14 type swaging dies for 22's from 22rf. Subject at hand, cores. Cast slugs or cut wire, is one better than the other. I have a bunch of dead soft, along with other alloys. So I am leaning towards a mold. I have access to a mill and have my own lathe. So I am thinking an adjustable mold to change up on weights. the cut wire has been the old stand by but it required a die that would size the wire and "squirt" out the excess so that all the cores would be fairly close to the same weight. nowadays lots of people are having good luck with cast slugs because they can be close enough in weight that you can just core seat and be done, eliminating 1 step. I am by no means an expert but have played with both ways and much prefer the cast cores over the cut wire. Yep, I like cores too. Also cheaper than wire. I would think cast would be better. If you have a core swage die dont think it would make any diffrence. +1 for cast being equivalent to wire. Wire is nice as you skip the hot lead step but I am a lead farmer and hoard all sorts of scrap lead. 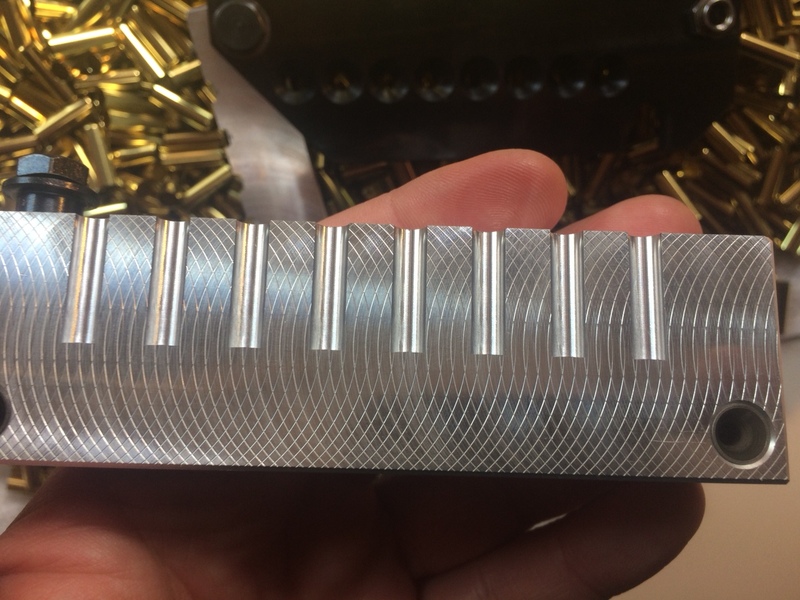 I use cast cores for my precision loads for 338LM and I get as good if not better results from my swage bullets with cast core as I can get with Sierra Match Kings which use wire cores. 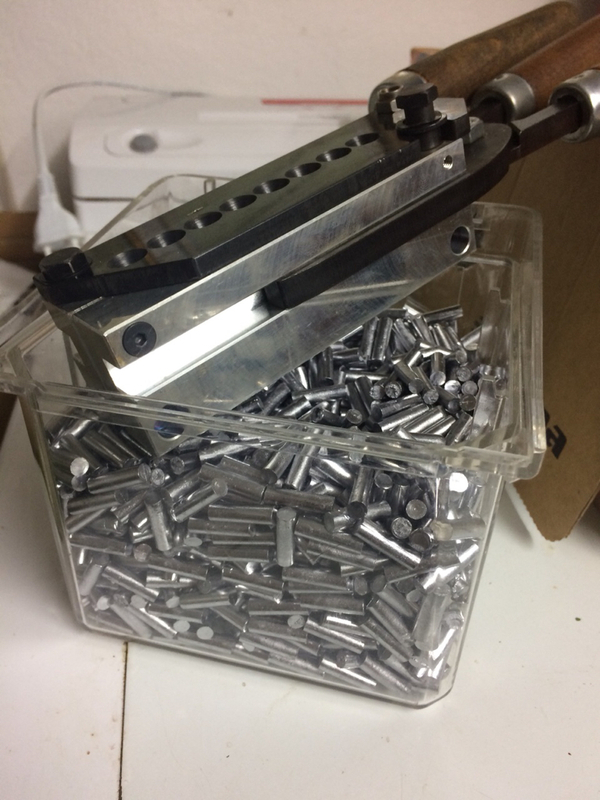 I think the OP should just stop worrying about such trivial concepts and do himself s favor by selling me those swaging dies for a small (very small) profit and extract himself from going down the rabbit hole. Just a thought. Actually that would probably be in my best interest. I have a five gallon bucket of Eley brass coming about Christmas. All shot out of pistols on an indoor range. I am curious to see how the firing pin indent looks on these. I have been on a search for some short brass to make 22 hornet projectiles. This CZ has the stupid 1-16 twist. I may wish I had kept my Savage. People that think cast is better have never experienced the convenience and accuracy of working with wire. Full disclaimer, since I have a Hydro Press, I extrude my own wire for the cost of the pure lead. Having said that, I've tried both methods, the variable length core mold and wire. Wire is easier, no comparison. I can hold .5 grain tolerance in my core cutter and you can cut 1000 cores in the time it takes you to cast 100. If your time is not valuable to you, casting is a viable option. If you just want to get on with it, give wire a try. For 224”, IF you know what is your max weight (mine is 62grs), you can invest in fixed weight 185” core mould. I have 50grs and 55grs. Had adjustable 4cav-very slow. Enter 8cav alu, cnc milled. Cast soft and swage to desired weight, it literally makes 1000 cores in 1hrs. I have 0.2 variance in weight. MP mold. Shoot a lot of 22 Hornet and 22 K Hornet. For just sniping ground hogs, coyote and plinking use the Midway Dogtown bullets in 500 count boxes. They are super inexpensive and fairly accurate. All my Hornet variations shoot sub MOA with Dogtowns. I also shoot a lot of Aguila 60 grain Sniper Subsonic target rimfire as out to 75 yards drops ground hogs and coyote DRT and is dead quiet in my suppressed mostly Kidd rifle with proper spring set to cycle the subsonic though the work 85% in most of my repeaters due to the 60 grain projectiles allowing all the pressure to push on the light Ely short case. Shoot a boat load of these and it's amazing how the 50% increase in projectile weight kills varmints. Actually dropped a deer on a crop destruction permit using one of the 60 grain rimfire projectiles with a single shot DRT. When shoot deer with Hornets or rimfire put in their ear and they drop like struck by lightning. My jacket swaging die removes all firing pin traces only a shallow portion of the company logo is visible on case bottom. They short Ely cases iron out like soft butter.